The universe is full of atoms and the smallest of all is the electron. Just think that calculating the charge a small particle is such a great thing and the American Scientist, Robert Millikan had just done that. The principle that was formulated by Einstein known as photo electrical effect theory was also proved by him and he find out Planck’s constant value. He received Nobel Prize in 1923 for his work in physics. 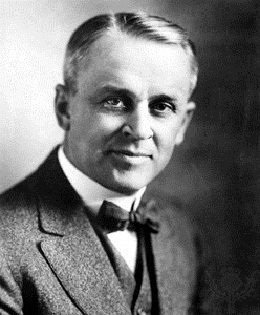 Robert Millikan was born in 1868 on March 22, in the city o Morrison in Illinois in America. He grew up watching nature, agricultural activities, fishing, and playing tennis. To understand the physical labor, he worked in a factory at the age of 14 years for one dollar working 10 hours per day. After his high school, he took up Greek mathematics in college and received a degree in literature. Once a Greek professor had asked Millikan to tell a physics lesson to students, then he said that he does not have any knowledge in physics. Then the professor said that if physics books that are in the Greek language are read then one can easily explain the lesson. Millikan was motivated by this and studied the physics book and explained it to the students and as a result got M.A. degree in physics. The Columbia University had noticed his interest in physics and gave him fellowship and he got a PhD degree. He had written so many books on modern physics that are explained easily and till now his books are followed as standards. When he was as assistant professor in the Chicago University, he had discovered a method to measure the charge in the electron known as the “Millikan oil drop method” by this the value of the electricity can be founded by e=1.59 x 10 -19 Coulomb. By this method, mass of the electron could also be measured. When he was the Director for California Institute of Technology, he found that the rays which are coming from space are cosmic rays and had done interesting experiments on them.